A disaccharide formed in the hydrolysis of starch and consisting of two d-glucose residues with a 1,4-α-glycoside linkage. 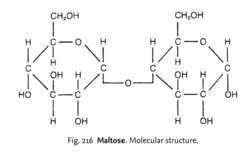 /mal·tose/ (mawl´tōs) a disaccharide composed of two glucose residues, the fundamental structural unit of glycogen and starch. A white disaccharide, C12H22O11, formed during the digestion of starch. Also called malt sugar. A disaccharide composed of two glucose molecule joined by a 1–>4 bond via a condensation reaction when amylase breaks down starch, as occurs in germinating seeds such as barley. A disaccharide formed in the hydrolysis of starch and consisting of two d-glucose residues. A disaccharide sugar consisting of two linked molecules of glucose. It is produced by the enzymatic splitting, during digestion, of starches and glycogen. Fig. 216 Maltose . Molecular structure. a disaccharide CARBOHYDRATE consisting of two GLUCOSE units linked by a GLYCOSIDE bond and common in germinating barley (see Fig. 216 ). The barley seeds are soaked in water, initiating the release of large amounts of AMYLASE, a hydrolytic enzyme that breaks down stored starch into maltose, a reducing sugar. a disaccharide composed of two glucose molecules, present in beer, cereals and germinating seeds, which makes only a small contribution to the carbohydrate content of a normal diet. Also called malt sugar. Broken down by the enzyme maltase to two molecules of glucose. n malt sugar, a disaccharide formed in the hydrolysis of starch and consisting of two glucose residues bound by an α(1,4)-glycoside link. a sugar (disaccharide) formed when starch is hydrolyzed by amylase. Pintos oriundos de ovos suplementados com maltose, sacarose e dextrina (TAKO et al. Blood glucose concentration increased from 348 to 580 mg/dl 30 min after the administration of maltose (2. Dextrose, sucrose and maltose have been used for this purpose, and the special characteristics of the sugars provide some different effects. Seventy-nine (90%) case-patients received sucrose-containing IGIV products, seven received IGIV with maltose or glucose, and two received IGIV in which the stabilizer w as undetermined. The carbohydrates used as carbon sources and enzyme inducers included: sodium polypectate, apple pectin, xylan (Sigma Chemical Company), lactose (Mallinckrodt Chemical Works) maltose and sucrose (Fisher Scientific). Similar relative fitnesses between nutrients do not therefore imply that rates of transport, growth, and other dynamic variables are equal in glucose and maltose but only that the "relative" change from the ancestral condition has been similar in each nutrient. Third cluster contain four main sugars, maltose, galactose and fructose have highest membership of 99. These isolates also showed positive indole production, glucose aicidification, arginine dihydrolase, esculin hydrolysis, gelatin hydrolysis, 4-nitrophenyl-ssD-galactopyranoside, Glucose assimilation, arabinose assimilation, mannose assimilation, mannitol assimilation, N-acetyl- glucoseamine, maltose glucoseamine, gluconate glucoseamine, caprate glucoseamine, adipate glucoseamine, malate glucoseamine and cytochrome oxidase. By acting at random locations along the starch chain a-amylase breaks down long- chain carbohydrates ultimately yielding maltotriose and maltose from amylase or maltose glucose and limit dextrin" from amylopectin by an endoacting hydrolytic mechanism thereby making it amenable to the action of amyloglucosidase for saccharification to reducing sugar [2 3]. Paul, MN, has patented a solid detergent composition comprising a first alkalinity source consisting essentially of at least one alkali metal silicate; at least one saccharide comprising sucrose, fructose, inulin, lactulose, maltose or combinations thereof or at least one sugar alcohol comprising sorbitol; at least one polycarboxylic acid polymer; water; optionally a secondary alkalinity source comprised of sodium carbonate; and a nonionic surfactant. Tess Szamatulski, co-founder of Maltose Express Homebrew Shop; Former rocket scientist and future craft brewer Mark Szamatulski; Marty Juliano, Northeast rep for Sierra Nevada Brewing Co.